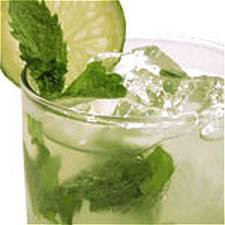 Muddle the lime, mint, and sugar into a tall glass, but be easy on the mint leaves. Then pour in the alcohol and lightly stir to dissolve the sugar in the alcohol. When the sugar has dissolved, fill with ice and top the cocktail with club soda. Stir to mixture, drop in a straw and relax!